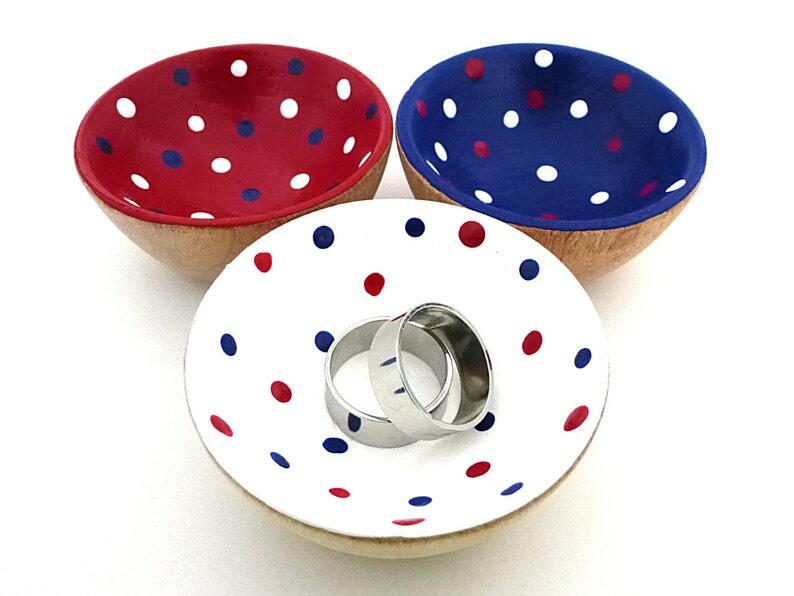 Store your jewelry or other tiny items with pride in an adorable red, white and blue painted bowl! Patriotic and colorful decor makes a fun statement. These little bowls are especially great gifts for military personnel, government workers, veterans and patriots! Makes a perfect place to hold your rings and earrings while washing your hands or showering! All my items are handpainted and sealed. Because of the natural materials used, variations may occur. • Packaged in gift box = item will be shipped in assembled gift box with decorative tape and a gift receipt. If you would like to include a gift message, please write it in the "Note to shop" at the end of the checkout! This is a cute bowl. Unfortunately, it is much smaller than expected, so this will be a paper clips bowl instead of a jewelry bowl.